This is your brain on drugs. Whether you remember the 1987 egg-in-frying-pan version of that public service announcement (PSA) or the more melodramatic version from 1998, chances are it’s a refrain that’s pretty easy to recall for anyone older than, say, 25. 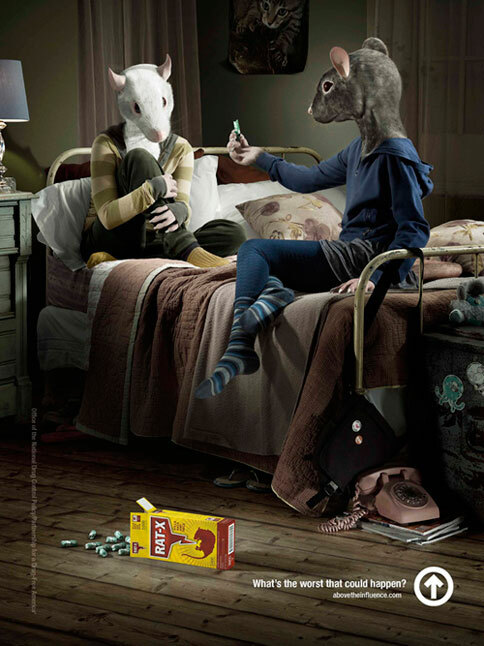 Since the 1980s, the Ad Council and the Partnership for a Drug-Free America, as well as other organizations, have undertaken the noble cause of trying to prevent adolescent drug use with the help of advertising campaigns on TV and in print, and, more recently, online. Initially the PSAs tended to be more embarrassing than informative, resulting in countless spoofs. In the last decade, though, there have been a few hits (as well as some misses), and research shows that some PSAs might actually be working. With the help of John Yost, a 30-year advertising veteran, I took a look at some of the most unforgettable anti-drug PSAs to ask whether any made it more likely a viewer or reader might think twice before trying a substance. Message: Don’t do drugs. If you do, you are a loser (naturally, only losers use drugs). Was it effective? The campaign encourages kids who have questions about drugs to ask a “parent, teacher or minister.” The flaw is obvious: How many teens do you know who think any of the adults mentioned are arbiters of what is or isn’t cool? “This country has Puritan roots and we have a tendency to scold rather than educate,” says Yost. 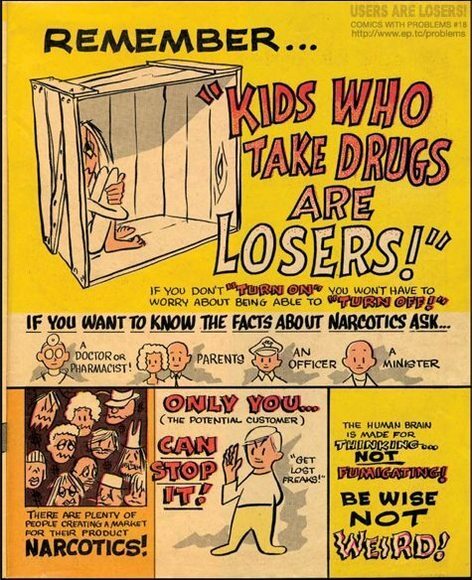 “It’s not an effective tool in parenting and it’s not an effective tool in advertising, either.” Further, a cartoonish advertisement featuring adults and/or a large dog wearing a trench coat isn’t likely to be taken seriously by any teen, much less change his or her attitude about drugs. Message: If you do meth, you’ll behave in scary, immoral and dangerous ways that you wouldn’t otherwise. Message: Smoking is so addictive and bad for you that you won’t be able to stop, even after it destroys your health. Was it effective? Research suggests that the California Tobacco Control Program’s campaigns were successful in reducing the number of cigarettes smoked between 1989 and 2008. The best anti-drug PSAs aren’t the ones that tell you what to think, but rather, encourage viewers to come to their own conclusion. This ad made an unforgettable point without being didactic. The woman’s words, “they said smoking wasn’t addictive,” contrast sharply with her actions: needing to smoke through the hole in her throat. “It takes something visually horrifying to really catch your eye in the image-saturated world we live in,” Yost says. Importantly, the accusatory or shaming finger isn’t pointed at the smoker (user), something that makes this ad stand out from many other PSAs. Message: Drug users are scum or, more precisely, the equivalent of insects and rats. Was it effective? Can we all agree that cartoons and/or anthropomorphized bugs aren’t going to have much of an impact on teenagers’ attitudes about, well, anything? The implication that adolescents who use drugs are as bad as insects and rodents — invasive, disgusting, hard to get rid of — is likely to be both insulting and ineffective as a tactic. Message: Drinking or using drugs will cause you to do stupid, dangerous things. Was it effective? This campaign achieves the difficult task of showing the often tragic health consequences faced by long-term smokers without being exploitative or offensive (something the Montana Meth Project has arguably fallen prey to with some of their images). This is achieved by humanizing the people depicted, showing them talking about their daily routines and making them a source of inspiration, as opposed to an object of the viewer’s pity. “You can quit,” these survivors attest. “This kind of approach is successful because it counters decades of glamorous smoking images in movies, ads and online videos, with equally compelling negative, emotional, associations of limitation, disease, deformity, loss,” says Yost. Photos (from top): Partnership for a Drug-Free America; National Crime Prevention Council and the Ad Council; Montana Meth Project; California Tobacco Control Program; Office of National Drug Control Policy and Partnership for a Drug-Free America; Partnership for a Drug-Free-America; Arnold Worldwide Global Creative and Advertising Agency and the Centers for Disease Control. Same here. Well, a Psych ward in Chicago for me, but yeah. I still vividly remember that lady smoking through her throat, though. It didn’t make me refrain from cigarettes but it made me feel scared and guilty as hell when I smoked. Oh, now that would have been NASTY!!! Thank God I quit those frickin’ things! Same. It was so hard to do, though, in some ways harder than quitting drinking. Way harder than putting a plug in the jug. Previous Sally and I are interviewed by Coffee with a Canine!